At this writing, FRANKEL has kicked off Royal Ascot 2012 with a scintillating 11-length victory in the Queen Anne Stakes on the first day of the meeting. As both he and BLACK CAVIAR are the big draws of Ascot this year, one hopes that FRANKEL’s victory augers well for the magnificent Australian champion, who will run on the last day, Saturday, June 23rd. In the meantime, here are more tips on some of the horses in the significant races from Thursday, June 21 to Saturday, June 23. For those wanting to reread Part One, please see the RECENT POSTS listing on the left side of this page. A magnificent individual, Bahamian Bounty stands at The National Stud and is one of the UK’s most consistent sires. His son, Cay Verde is the favourite in today’s Norfolk. First up are more 2 year-olds running in the Norfolk. The distance is a reasonable 5 furlongs, the favoured distance for youngsters in UK racing and in many international venues. The wisdom that babies start short and then are lengthened out over time dominates the thinking of most UK and Euro trainers. As we have said earlier, these are babies and while the punters may have their favourites, almost anything is possible when you get a bunch of inexperienced juveniles together. The favourites are Cay Verde (Bahamian Bounty ex. All Quiet) trained by the talented Mick Channon for Qatar Racing Limited. Cay Verde is 3-2-0-0 going in, having won his last two starts. 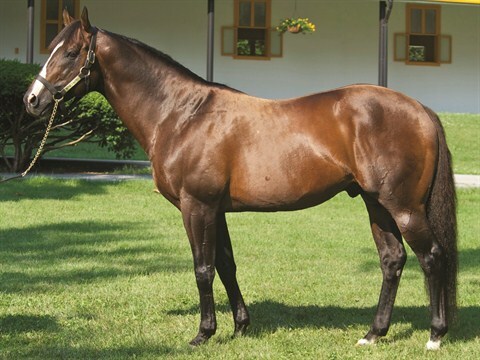 Second choice is a son of Proclamation out of Rockburst, Annunciation. He too has raced only 3 times before and starts with a record of 3-1-2-0. Trained by Richard Hannon, we can expect he’ll be ready to run. Like Cay Verde, he won his last time out (maiden). A third colt worth mentioning is Gale Force Ten (Oasis Dream ex. 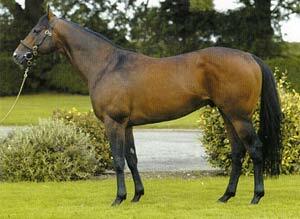 Ronaldsay) who races for Coolmore-Ballydoyle. 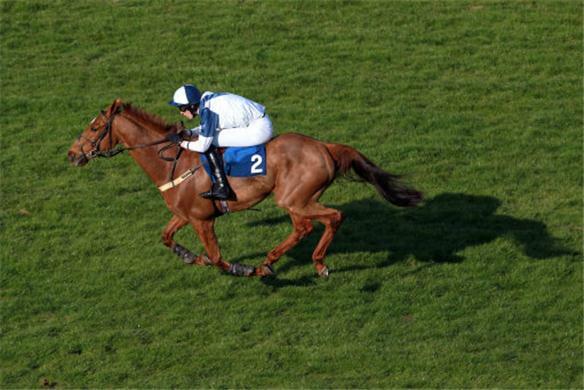 He’s the least experienced though, having only 2 races under his belt, although he won last time out (maiden). An American connection comes in the form of Richard Hannon-trained Mister Marc, by Acclamation ex. Fathoming, a daughter of the beloved Gulch. Mister Marc has only raced twice as well, but ran second his last time out. 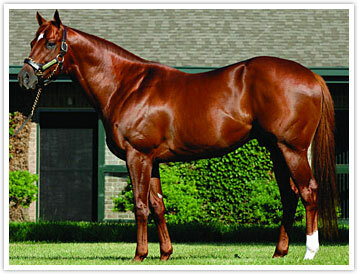 The beloved Gulch, BM Sire of Mister Marc. This race is setting up to look very much like a re-play of the 2012 Investic Oaks, with most of the principals nominated to start as of today. 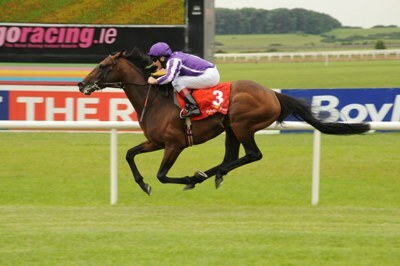 Coolmore-Ballydoyle (Aidan O’Brien) has one Galileo filly, Twirl running. She is 5-1-2-1 and her BM sire is none other than Storm Cat. Other stars who ran extremely well in the Oaks and are entered in the Ribblesdale include Andrew Lloyd-Webber’s lovely filly, The Fugue (Dansili) who, despite a troubled trip was closing like an express train to finish third in the Oaks. Trained by the brilliant John Gosden, we can expect a great run from her. The Fugue’s race record to date is 4-2-0-1 and punters have her as the favourite. Another filly to watch, who ran second in the Oaks, is Shirocco Star (Shirocco). Then there is William Haggas’ Vow (Motivator) who will be looking to improve a rather disappointing performance in the Oaks. Here’s the running of the 2012 Investic Oaks — a kind of “dress rehearsal” for the Ribblesdale, as it turns out. Note the effort from The Fugue in particular. Shirocco Star is also a contender. The Gold Cup was the very first race to run at Ascot, decreed by the monarch who discovered the Ascot terrain, Queen Anne, in 1711. So this is a race that relives a rich, historic narrative each and every year. The current favourite to win this prestigious race is the Aidan O’Brien-trained Fame And Glory, who won it last year. The 6 year-old son of Montjeu has garnered 43% of the betting at this point in time. And no wonder. Out of 22 starts, he’s only ever been out of the money 4 times and goes to post with a record of 22-14-3-1, having come home first in his last 2 starts. He’s a seasoned horse by a champion sire and his BM sire is the great Shirley Heights, the son of British Champion, Mill Reef. But nothing in horse racing is a sure thing and over a distance of 2 m,4 f a good deal will be asked of him. Overshadowed as a 3 year-old by the incomparable Sea The Stars — to whom he ran second twice — Fame And Glory carries the hopes of Coolmore into the Gold Cup. Ironically, the second favourite at this time is Opinion Poll whose BM sire is also Shirley Heights; and it was Opinion Poll who chased Fame And Glory home in the 2011 Ascot Gold Cup. Owned by Godolphin, he’s another very seasoned individual, having a record of 25-10-6-5. Opinion Poll is by millionaire Halling, a son of Diesis who was bred in the USA. Halling also ran for Godolphin in the year of another great colt, Lammtarra, winner of the Epsom Derby and the Prix de l’Arc de Triomphe. Halling was a very honest horse during his racing days but upstaged by the brilliant Lammtarra; Opinion Poll is very like his daddy in this regard. This courageous colt comes into the Gold Cup having won his last two races, one of which was the Dubai Gold Cup. Champion Halling, the sire of Opinion Poll, was an honest colt who always did his very best. At stud, Halling has had some useful progeny. But Opinion Poll is a superstar! Opinion Poll tops the list of spoilers to Fame And Glory’s attempt at the Gold Cup. Two others to watch are Godolphin’s Colour Vision (Rainbow Quest) and trainer John Oxx’s Saddler’s Rock (Sadler’s Wells), both of whom have looked very sharp in their last respective 4-5 races. There are two races on Friday that will spark the greatest interest. Noble Mission is Frankel’s full baby brother. Although he won’t be the favourite going to the post, even in a tiny field of only 7 runners, it will be Frankel’s baby brother, Noble Mission, who is likely to steal most of the attention. Not only is the 3 year-old Frankel’s younger brother — more importantly, he is a full brother. And, keeping it all in the family, he’s got winning ways of his own. With only 4 starts under his belt, the colt has never been worse than second and won his last time out. Trained by Henry Cecil, Noble Mission will have his big brother’s jockey, Tom Queally, to help him turn this Grade 2 event into a real horse race. Astrology is the current favourite to win this Grade 2 event for Aidan O’Brien and the lads at Coolmore-Ballydoyle. As we go to press, the resounding favourite is Coolmore-Ballydoyle’s Astrology (Galileo). The colt raced last in the Epsom Derby, where he came in third and this would be considered a very good effort, given the talent of the winner, Camelot. He’s had 5 starts and always finished in the money. Astrology will be piloted by the great Ryan Moore. Shantaram is likely to make a race out of it. A third colt to watch is John Gosden’s Lingfield Derby Trial winner, Shantaram (Galileo). This is a very sound colt with a good deal of staying power and a really nice turn of foot. Shantaram’s race record to date is 4-1-3-0 and this race is a bit of a step up for him. But with the talented William Buick in the irons, he just might surprise everyone. Note that all three of these fine colts share the same sire — Galileo. 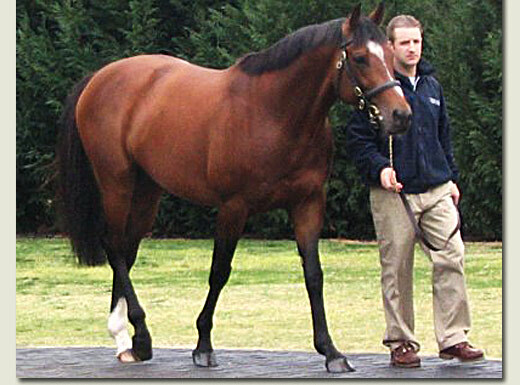 The Daddy of them all – Galileo. The top contenders in the Edward VII Stakes are all sons of Galileo. If you’re looking for an American connection, there’s John Gosden’s Thought Worthy (Dynaformer) who has the legendary Frankie Dettori up and has already beaten Noble Mission once. 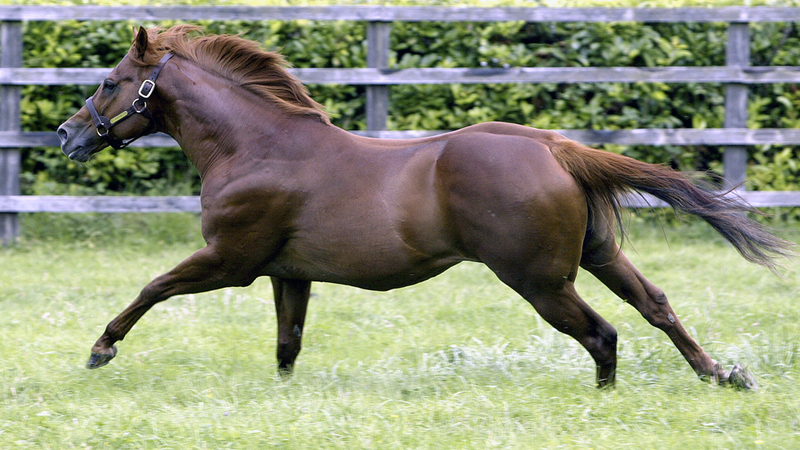 John Dunlop’s Farhaan is a son of Jazil, but there is some concern that the distance is not ideal for him, even though his sire won the Belmont Stakes. The Coronation Stakes is a Grade 1 and part of the British Champion Series in the UK and the race brings together some of the best 3 year-old fillies in the world. It is, as its name belies, a very classy race with a number of champion fillies set to compete. A daughter of Rock of Gibraltar, Samitar comes into the race with a record of 9-3-2-2. She’s trained by Mick Channon, who is noted for his success with fillies. She’s very likely the favourite because none of the fillies who’ve beaten her are running, although she has the breeding to get the job done. 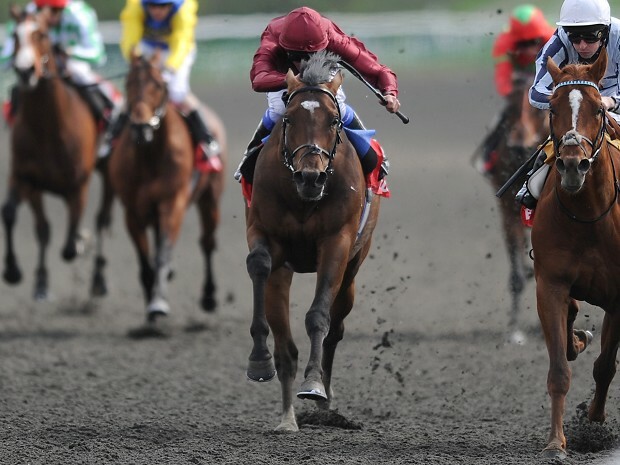 And: Samitar won the Irish 1000 Guineas impressively earlier this year, beating both Ishvana and Homecoming Queen. An interesting filly, also trained by Channon, is Laugh Out Loud, a daughter of Clodovil (Danehill). She comes into the Coronation off two wins and might well be the spoiler. As well, she’s bred to run on a deeper turf and Friday might just be her lucky day if there’s more rain Thursday. Then, too, there is William Haggas’ Cardigan (Barathea) who only makes her second start. But she won her maiden going away and has the breeding to go the distance. All in all, the Coronation promises to be very competitive — a real thrill to watch, especially if Homecoming Queen steps up to challenge her nemesis, Samitar. Any way you slice it, Saturday belongs to Black Caviar — and we’re betting even the hardiest Brit is feeling exactly the same way! In fact, it goes without saying that the Queen will find a way to meet the great mare in person and talk to all of Nelly’s connections, especially trainer Peter Moody and jockey Luke Nolan. 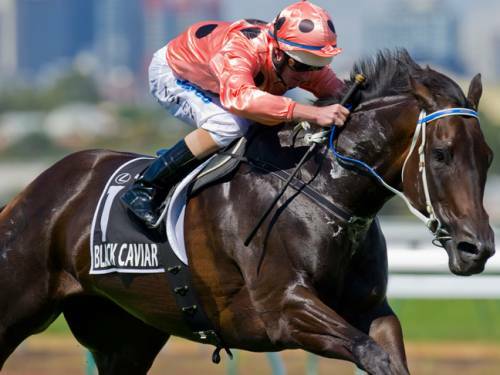 As befits a royal equine, Black Caviar’s race will announce the official ending of Royal Ascot, although other races will be run over the course following the Diamond Jubilee. If there’s another race that peaks the curiosity, it has to be the 7 f. Chesam for juvenile colts and fillies. Keeping in mind that the field won’t be finalized until sometime Thursday, as we go to press it’s a decidedly odd and interesting list of nominees. For starters, there’s Mick Channon who has entered seven babies, all of whom were sired by Sixties Icon, a very good son of –you guessed it — Galileo. 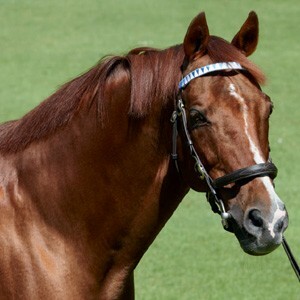 As a runner, Sixties Icon won the St. Leger, Jockey Club Stakes and the Cumberland Lodge Stakes, all in England, retiring with earnings over 1 million and giving his young sire a solid reputation. Sixties Icon raced until he was almost 6 years old and these babies of Channon’s hail from his first crop, making the Chesam a testing ground for sire and progeny alike. Channon’s 6-pack: Chilworth Icon, Rated, The Sixties, Cruck Realta, Effie B, Fadeintoinfinity and Sojoum. Of course, it’s unlikely that all of these will start, but of the group, it is the filly Effie B who is most experienced having had 5 starts, winning once and only out of the money once. Then there’s Aidan O’Brien and company with another 6 nominated. One colt hails from an untested sire: Count of Limonade, by Duke of Marmalade, one of O’Brien’s favourites during his racing years. The other 5 are all by — you guessed it — Galileo: Kingston Jamaica, Magician, Mars, Ruler of the World and The United States. And, it would appear, Magician, Mars, Ruler of the World and The United States are running for the very first time. 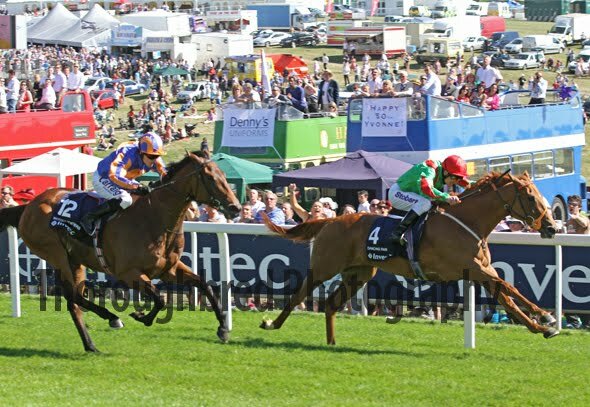 Other babies to watch include Lovely Pass (Raven’s Pass) who is 1 for 1; a Dynaformer filly trained by John Gosden called Chat, who is 1 for 1; Godolphin’s Tha ‘Ir (New Approach, a hot young sire) who won his last time out; and Richard Hannon’s colt, Jalaa (Street Cry) who is also 1 for 1. The keenly anticipated Diamond Jubilee Stakes is a G1 race, run over a distance of 6f and part of the British Champion Series. It’s also a Global Sprint Challenge. Although there have been a number of defections, the numbers stand at 57 entrants and this will only be finalized later Wednesday. 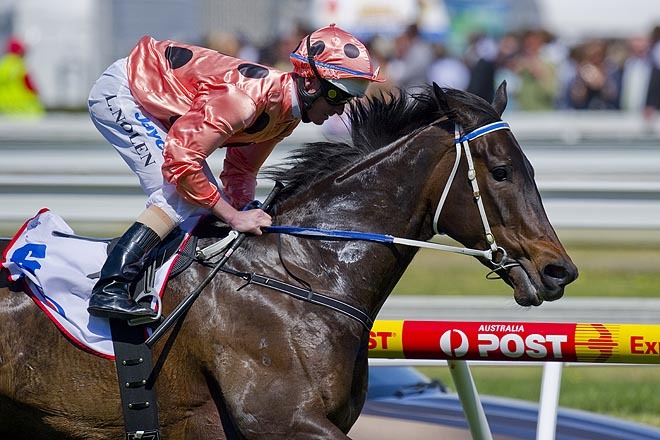 The other superstar to grace the turf at Royal Ascot 2012 is Australia’s Black Caviar. She will have her regular jockey, Luke Nolan, in the irons and trainer Peter Moody will also be present, having arrived at Newmarket a few days ago. Nolan, who landed Medicean Man in the King’s Stand on Tuesday and may pick up more mounts prior to the Diamond Jubilee itself, remains confident of the champion’s chances. Even though there are 57 horses listed, those expected to be the greatest threat just don’t have her numbers. At present, Black Caviar’s rivals include 4 from Aidan O’Brien: Power (Oasis Dream), Reply (Oasis Dream) and the fillies After (Danehill Dancer) and Wave (Dansili). Society Rock (Rock of Gibraltar) is a colt who won this race at Ascot last year and loves the going. Roger Charlton’s Bated Breath (Dansili) is expected to be a serious contender. Charlton is rated 4th best trainer in the UK and feels his colt’s chances against the Aussie heroine are better than good. One never wants to underestimate Freddy Head, the man who rode Miesque to glory and trained the great Goldikova, among others. He comes to the Diamond Jubilee with Moonlight Cloud (Invincible Spirit) who has a record of 10-6-1-0 and won her last time out. Moonlight Cloud is a classic 4 year-old, who has done well on sprints, having already won at 6f a total of three times, including her last win. Still, as the Australian racing community sees it, their superstar mare will make all of the running, even though she’s had to travel halfway around the world to do it. Her biggest obstacle might be exactly that, since Australian horses have been known to run contrary to their real ability at Ascot due to the radical change in weather and turf conditions. The weather itself is a concern and its impact on the condition of the turf, although it’s safe to say that if the course were dangerous, Nelly (Black Caviar’s stable name) would be scratched. The field itself might be very large, posing stratregic issues. We want to go on record as stating that this brilliant thoroughbred has nothing to prove. Black Caviar and her team’s contribution to the sport cannot be estimated, except to say that it is huge. The champion’s trainer and assistant trainer have been unfailingly courteous with the press, even though the United Kingdom has gone “Black Caviar mad.” There are few who wouldn’t understand what coming to Ascot means for an undefeated superstar. North Americans appreciate the risk, given the relatively recent career of the amazing Zenyatta who, in defeat at the 2010 Breeders’ Cup, arguably ran the best race of her entire career — as our Australian friends were quick to observe. 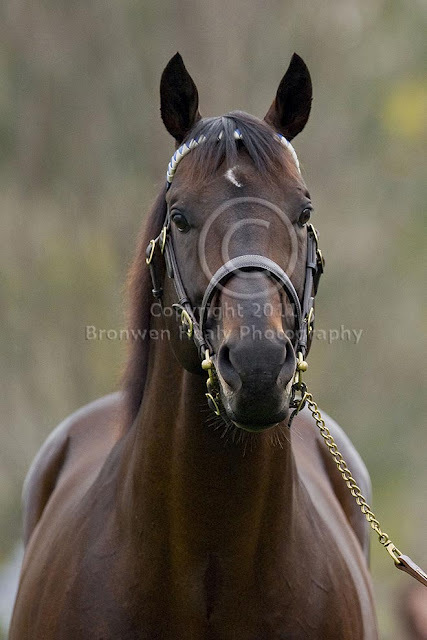 Another fabulous shot of Black Caviar by Australian photographer extraordinaire, Bronwen Healy, one of Nelly’s “special friends.” Photo and copyright, Bronwen Healy. We start our video line-up with a recent interview with Black Caviar’s trainer, Peter Moody, followed by an informative chat with Tony Haydon (one of Black Caviar’s best human friends) who talks about Nelly’s personality and some of her more unconventional Newmarket routines. We wind up with Nelly’s Australian fans and their special way of supporting Nelly as she races in the Diamond Jubilee, together with a chat with her jockey, Luke Nolan. Our love rides with you, Nelly. Run like a girl ….. and, most important of all, come home safe. We all know our own racing venues pretty well, but keeping track of international racing to the same degree can really be a challenge. This year at Royal Ascot 2012, the stars of thoroughbred racing are aligned — Frankel, Black Caviar, So You Think, Fame and Glory, St. Nicholas Abbey, Helmet, Sepoy, Ortensia and a host of other elite thoroughbreds whose names are less familiar to many. This article reviews some of the top horses and their connections who are slated to run at Royal Ascot next week. The content is designed to keep our readers on top of all the key information as it is known at this time. The goal is to provide VAULT readers with an informed viewing context. We doubt that readers will digest all of the content in one sitting, so the article will remain posted until Wednesday, June 20th for those who might want to visit again before specific races, or read up on some of the winners. Then, on Wednesday Part Two will be posted and cover the remainder of Thursday at Ascot, as well as Friday and Saturday. In the UK, the racing program is referred to as a “race card.” As of today, the cards still reflect all the horses who’ve been nominated. Coolmore-Ballydoyle’s So You Think, for example, is listed in more than one race. Below is the schedule for the full 5 days of Royal Ascot 2012, courtesy of the UK’s Racing Post. Entries in each race should be finalized about 24 hours before the race. If you refer to the Racing Post link (above) there is a section labelled CARDS that will be updated and tell you exactly who is running on the day. 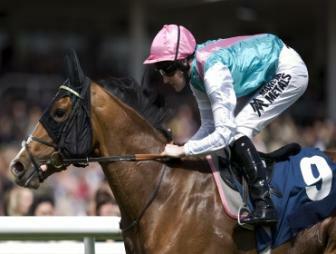 Frankel and his regular jockey, Tom Queally. 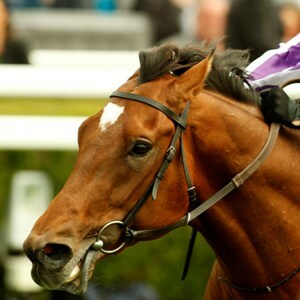 First up is the undefeated FRANKEL (Galileo) who runs on Tuesday in the 1-mile Queen Anne Stakes. This will be Frankel’s first race at a mile. The brilliant 4 year-old will be taken on by 3 from Coolmore-Ballydoyle (Aidan O’Brien): Excelebration (Exceed and Excel) whom Frankel has already beaten, champion So You Think (High Chaparral) and 7 year-old Windsor Palace (Danehill Dancer). Australia’s Helmet (Exceed and Excel) has also been nominated, but may start against Black Caviar in the Diamond Jubilee instead. Should he run against Frankel, Helmet is not to be underestimated. He was a 2 year-old superstar in Australia and has continued his winning ways, albeit erratically because he tends to act up on race day and ruin his own chances. But he has the speed and, if he’s sharp, the determination. 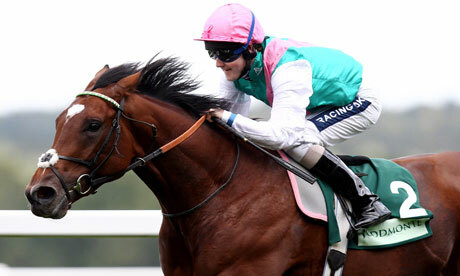 Frankel will have his half-brother Bullet Train (Sadler’s Wells) in there too. Bullet Train has raced with the champ twice and tends to play the role of pacesetter, even though he’s a very good colt in his own right. Black Caviar and jockey, Luke Nolan. Arguably, the other superstar to grace the turf at Royal Ascot 2012 is Australia’s Black Caviar. She will have her regular jockey, Luke Nolan, in the irons and we assume that Peter Moody, her trainer, will also be present — Moody is currently training his great mare from afar, relying on modern technology to watch her works each day. (Nolan has landed Medicean Man in the King’s Stand on Tuesday and may pick up more mounts prior to the Diamond Jubilee.) At the present time, 57 horses have been nominated to go up against the undefeated mare in the Diamond Jubilee Stakes on the last day of the meet, Saturday, June 23rd. That number will change as we get closer to race day, so be sure to check the race card on the Racing Post site. At present, Black Caviar’s rivals include 4 from Aidan O’Brien: Power (Oasis Dream), Reply (Oasis Dream) and the fillies After (Danehill Dancer) and Wave (Dansili). And as if that’s not enough, there’s Society Rock (Rock of Gibraltar), a colt who won this race at Ascot last year and loves the going there. Too, Australia’s Helmet is also nominated, as is Roger Charlton’s Bated Breath (Dansili). Charlton is rated 4th best trainer in the UK and feels his colt’s chances against the Aussie heroine are better than good. These last 3 have also been nominated in other Royal Ascot races, so there may be defections. Still, as the Australian racing community sees it, their superstar mare will make all of the running, even though she’s had to travel halfway around the world to do it. We start our video line-up with Black Caviar’s arrival at Newmarket, followed by a look at Society Rock’s trainer, James Fanshawe and then wind up with pre-race ditties and analysis, courtesy of TVN Racing Network (Australia) under the title “Black Caviar’s Destiny.” Note the ties sported by announcer Bruce Clark and analyst Mick Sharkey — TOO CUTE! The King’s Stand is going to be very competitive this year and we might expect several defections from the Diamond Jubilee to run, since it is also a sprint. Chief among these might be the promising Bated Breath (Dansili). Ortensia (Testa Rossa) who has already had 30 starts and is 11-3-4 is going to be a contender for certain: the 7 year-old Aussie mare is on a winning streak, having just completed a hat-trick of victories, including a come from behind effort in the Al Quoz Sprint at Meydan. Other horses of interest include Little Bridge (Faltaat) who has had 19 starts, winning the last 2, Sole Power (Kyllachy) who has a track record of 24-4-5-4 and might be sitting on a big effort and Tangerine Trees, who has won 12 of 35 starts and won twice the last 3 times out. 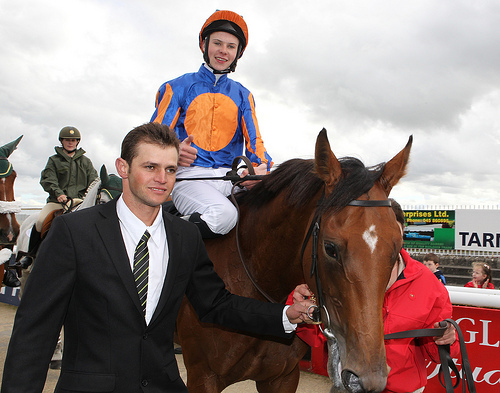 Of interest: Luke Nolan (Black Caviar’s regular jockey) rides Medicean Man. The lovely Ortensia, a 7 year-old Australian mare, is one of the favourites in this race. This prestigious race features a few familiar names from Coolmore-Ballydoyle: Daddy Long Legs (also nominated for the King Edward VII on Friday, June 23), Power (Oasis Dream) and Wrote (High Chaparral). Another starter from trainer Aidan O’Brien is Requisition (Invincible Spirit) who is lightly raced and has won his last 2 starts. The brilliant Lucayan (Turtle Bay) also looks to be running in the St. James; he’s also won his last 2 starts and can be counted on to be very well placed early in the race. William Haggas has Nine Realms (Green Desert) nominated here as well and he’s another lightly raced colt who won the last time out. 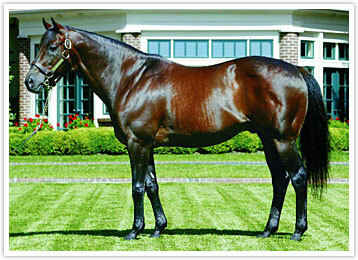 Green Desert was a fabulous sire and Nine Realms could be described as promising. For Street Cry fans, Fencing, trained by the incomparable John Gosden also looks to be starting in the St. James. Lucayan, shown here winning the Poule d’Essai des Poulins at Longchamps (France) earlier this year. The babies are on-track late in the day for the running of the Coventry Stakes. Of interest here are Annnunciation (Proclamation), Artigiano (Distorted Humour) who will have Godolphin’s skilled Frankie Dettori aboard, William Haggas’ Odooj (Pivotal) who is also nominated for the Windsor Castle (earlier on the same day), Richard Hannon’s Jalaa (Street Cry) and 2 from Coolmore-Ballydoyle: Lines of Battle (War Front) and Pedro the Great (Henrythenavigator). Given their age and experience, it’s really anyone’s race! The fabulous Street Cry, captured here by Australian photographer extraordinaire, Bronwen Healy. Claiborne’s War Front also finds himself represented at Royal Ascot in the Coventry Stakes. 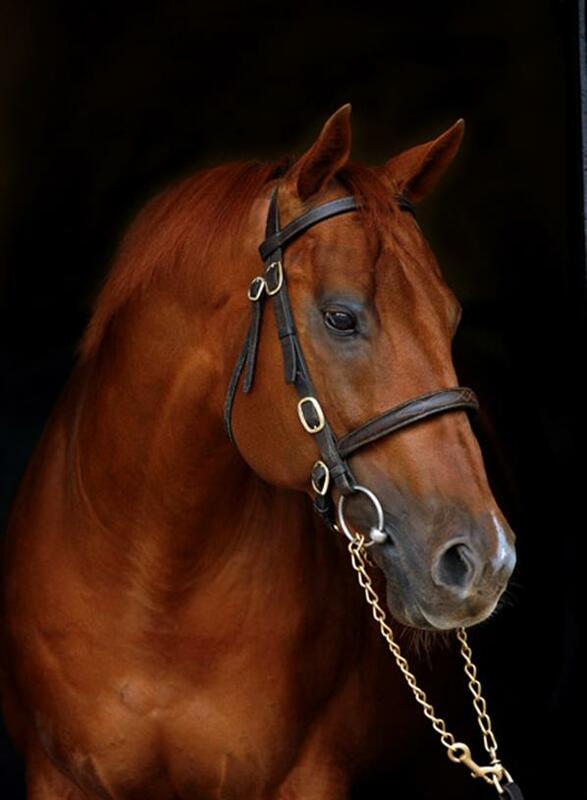 The wonderful stallion, Pivotal, is one of the UK’s leading sires. Young sire, Acclamation, is starting to make his mark. The last race on the Tuesday card again highlights promising 2 year-olds. Aidan O’Brien brings Gale Force Ten (Oasis Dream) and Parliament Square (Acclamation), while famed trainer, Richard Hannon, has loaded the race with 7 nominated colts: Alhebayeb (Dark Angel), Annunciation (Proclamation), Ask Dad (Intikhab), Ceelo (Green Desert), Lyric Ace (Thousand Words), Master of War (Compton Place) and Mister Marc (Acclamation). One would not overlook trainer William Haggas’ Odooj, a son of Pivotal, one of the UK’s truly outstanding sires. British trainer William Haggas has the distinction of being Lester Piggott’s son-in-law. But far more impressive — for a trainer with a modest number of horses at the turn of the century — is the fact that he has a 100% success rate in the the Epsom Derby and the Investic Oaks; he won the Derby with long shot Shaamit (Mtoto) in 1996 and came back again with the great filly, Dancing Rain (Danehill Dancer) to win the Oaks in 2011. Below is an interview with Haggas that focuses on his 2012 Royal Ascot hopes, including Roy & Gretchen Jackson’s (Barbaro) filly, Sentaril. A highlight in this race, at least for any who has yet to see him, is HRH the Queen’s champion colt, Carlton House. The son of Street Cry out of Talented (Bustino) is lightly raced at 4, although 2 of his three wins have come in stakes races. Trained by Sir Michael Stoute, Carlton House is bound to be the sentimental favourite in this Jubilee year. UPDATE: So You Think has been confirmed for this race and it may set up as quite the dual! The absolutely gorgeous Carlton House (Street Cry) owned by HRH Queen Elizabeth II. It would be fair to say that this 5-furlong race will be hotly contested since, as of today, well over a dozen of these babies have wins, places or shows already chalked up. But, they are babies. Which means that almost any of them stand a decent chance of winning. If you’re looking for a North American connection, Smart Strike’s Madame Mojito, bred at Lane’s End, is 2 for 2. Star Up In The Sky is a daughter of Speightstown who has only run once before and came in a respectably 4th. And there’s also Jadanna, a daughter of Mujadil (USA), who is also 2 for 2. 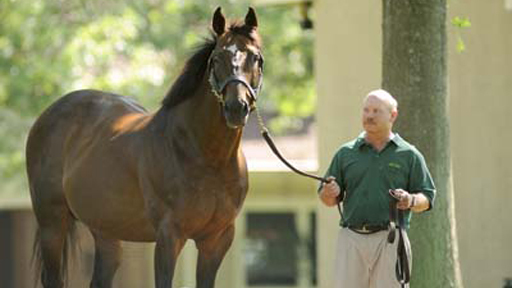 The great Smart Strike, pictured here at his home, Lane’s End, in Versailles, Kentucky. His daughter, Madame Mojito, runs on Wednesday at Royal Ascot. Other fillies that might sparkle include: Lady Phill (4 starts and never out of the money); JillNextDoor, a daughter of Henrythenavigator who is 2 for 2; a very good daughter of Pivotal with the unenviable name Hairy Rocket; a daughter of Tagula called Projectisle who is 2-1-1-0, as are the fillies Miss Diva (Acclamation) and Satsuma (Compton Place). Upward Spiral (Teofilo/BM sire Fantastic Light) comes in undefeated, with a maiden under her belt. Sire Speightstown’s Star Up In The Sky may be poised to break her maiden at Royal Ascot in the Queen Mary Stakes. We should also mention that Coolmore-Ballydoyle (Aidan O’Brien) have no less than five GALILEO fillies nominated for the Ribblesdale: Was (winner of this year’s Oaks), Maybe (brilliant winner for her sire, having only lost twice in 7 starts), Kissed (2 for 2), Twirl (who is 5-1-2-1 and whose BM sire is none other than Storm Cat) and Up (6-1-2-1). 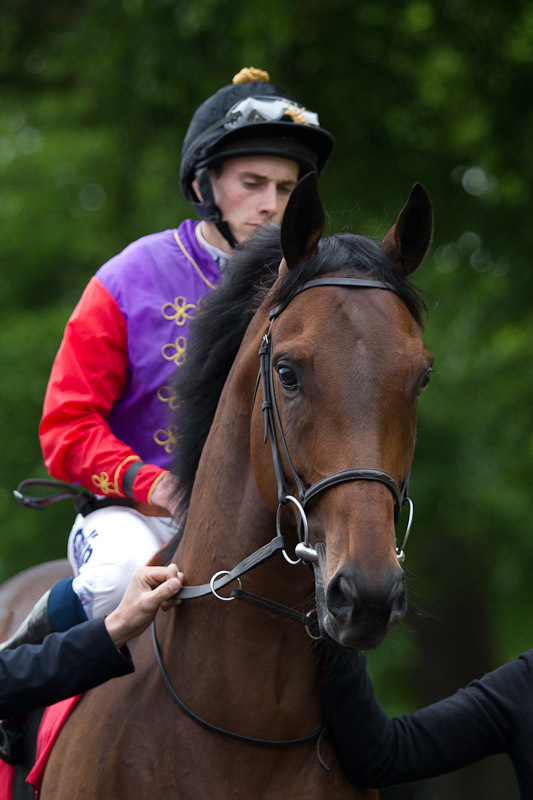 The brilliant Maybe, Joseph O’Brien up. Other stars who ran extremely well in the Oaks and are entered in the Ribblesdale include Andrew Lloyd-Webber’s lovely filly, The Fugue (Dansili) who, despite a troubled trip was closing like an express train to finish third in the Oaks. Trained by the brilliant John Gosden, we can expect a great run from her. The Fugue’s race record to date is 4-2-0-1. 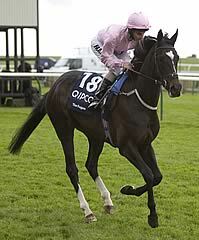 The Fugue, an exquisite filly with the heart of a lion, can be expected to run big in the Ribblesdale. Another filly to watch, who ran second in the Oaks, is Shirocco Star (Shirocco). Then there is William Haggas’ Vow (Motivator) who, if she runs, will be looking to improve a rather disappointing performance in the Oaks.